Heat the taco filling in the microwave until warm. Scramble the eggs and place in two microwave safe bowls. Divide the taco filling between the eggs and top with the cheese. Microwave the cheese for a few seconds, until melted. Top with the salsa, sour cream and other taco fillings, as desired. Enjoy! A container of leftover Old El Paso taco filling after a party is ripe with possibilities . . . and Breakfast? Yes indeed! Tacos are a favorite meal for entertaining at our house – kids, grandparents, men, women and the occasional yellow lab – who doesn’t love a taco? And I am always thrilled if there are leftovers. With on-hand cheese, tortillas, salsa and other fixings, a taco, taco salad or quick quesadilla are just an easy, microwavable minute away! Our newest compilation, however, takes our favorite party leftover taco filling to a different part of the day –breakfast! 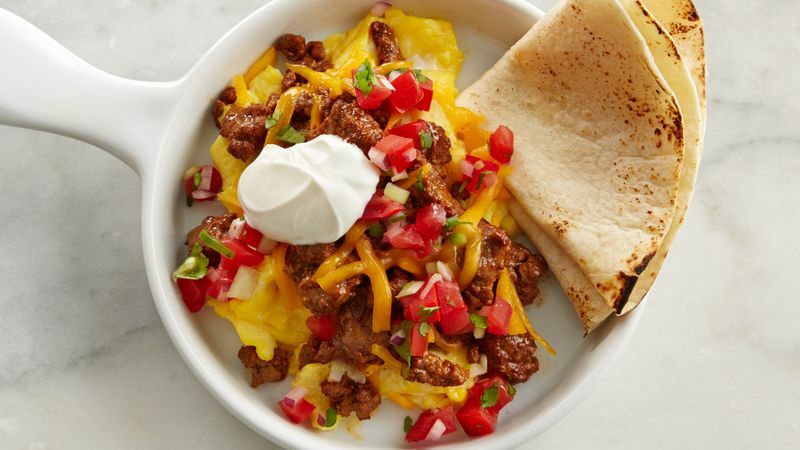 This is my husband’s favorite, so although technically a breakfast dish, at our house Taco Scramble also makes regular appearances at lunch, brunch, and from time to time, even dinner (with a nice tossed salad). It’s so fast and easy – you can even scramble the eggs in the microwave! Egg whites or egg substitutes will make this dish an even healthier choice. I am a big fan of egg whites – it’s just a personal preference, rather than any form of deference to calories. Any calorie savings is bound to be overwhelmed once I add the cheese and the sour cream (my tablespoon measures tend to err a wee bit on the heavy-handed side of things). However, as breakfast is the most important meal of the day, I let it slide. What’s your fave way to use your leftover tacos?